The nucleus is found in the middle of the cells, and it contains DNA arranged in chromosomes. It is surrounded by the nuclear envelope, a double nuclear membrane (outer and inner), which separates the nucleus from the cytoplasm. The outer membrane is continuous with the rough endoplasmic reticulum. The nuclear envelope contains pores which control the movement of substances in and out of the nucleus. RNA is selectively transported into the cytoplasm, and proteins are selectively transported into the nucleus. The nuclear membrane is supported by a meshwork of intermediate filaments, called nuclear lamins. One or more darkly staining spherical bodies called the nucleoli are found inside the nucleus. These are the sites at which ribosomes are assembled. Nucleoli are most prominent in cells that are synthesising large amounts of protein. Most cells have a single nucleus, though some have none (ie. red blood cells), and some have several (i.e. skeletal muscle). This image opposite shows a diagram of the nucleus. Nuclei look different cell types, and when cells divide. For example, in different types of white blood cells, in interphase, the nucleus can have one, or more lobes, and the number of lobes is characteristic of the type of white blood cell. This is the nucleus of a cell in interphase (between cell divisions). A bluish purple line around the edge of the nucleus is the nuclear envelope/nuclear membrane. The small darkly staining granules are chromatin (chromosomes). 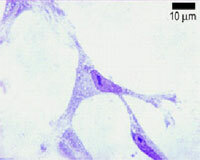 The larger dark purple structure is the nucleolus. This picture shows an electron micrograph of a nucleus. The short white arrows are pointing to nuclear pores. Note the appearance of eu- and heterochromatin, and the nucleolus. Heterochromatin stains more densely than euchromatin, but they are both forms of chromatin. Chromatin is the name for the diffuse granular mass of DNA found in interphase cells. Heterochromatin is less abundant, relative to euchromatin, in the large nuclei of active cells than in the small nuclei of resting cells, such as small lymphocytes. Euchromatin is "active" chromatin, containing DNA sequences that are being transcribed into RNA. The nucleolus is the site in the nucleus where ribosomal RNA is transcribed. It is then linked to the subunits of the ribosome, and transported out of the nucleus through nuclear pores. The ribosomes assemble, and translation of RNA and protein synthesis occurs in the cytoplasm. Protein synthesis occurs on free ribosome or on ribosomes attached to the endoplasmic reticulum (rough endoplasmic reticulum), in which case a pore is formed so that newly synthesized proteins move into the cisterna of the rough endoplasmic reticulum. The proteins synthesised on ribosomes attached to the ER, are then transported to the Golgi, and packaged for secretion. Cells are normally diploid - this means that they have a pair - two sets of homologous chromosomes, and hence two copies of each gene or genetic locus. However, cells can be haploid, polyploid or aneuploid. Haploid: only has one set of chromosomes - i.e. in a sperm or oocyte. Polyploid: Contains more than two sets of homologous chromosomes. Aneuploid: Have atypical chromosome numbers - can either have one or two extra chromosomes, or can lose chromosomes. This is abnormal, and can be diagnostic of cancer. The karyotype - is a count of how many pairs of chromosomes there are. This picture shows a 'G-banded' karyotype from a diploid mouse cell in metaphase. The chromosomes have been arranged into their pairs with their numbers are shown below. The characteristic banding pattern you can see is obtained by staining with Giemsa. Mice only have 19 pairs plus XY chromosomes, whereas Humans have 22 plus XY. Cell death occurs due to necrosis - i.e. when killed by bacteria, or due to apoptosis - programmed cell death - abrupt termination of the cell's usual life. Cell nuclei also look different when the cells degenerate as shown here: The nucleus can look very dark and purple, and the cell has very little cytoplasm - pyknotic. Alternatively, the nucleus can look very faded - karyolitic.